"The Role of Education in Peacebuilding Processes in the Democratic Republic of Congo"
"Economic Challenges for the European Union"
UPDATE: Read the story and view photos from this event! "The Dark Side of 'Service with a Smile' "
Several Paterno Fellows / Presidential Leadership Academy members will provide an overview of PLA and answer your questions. Open to all first-year Liberal Arts students; no RSVP required. Lunch with Honors Speaker Series ~ Lunch with Honors is cancelled today due to weather-related closure for University Park classes and activities. "Revival of Confucianism: Culture and Politics in Today's China"
Students are encouraged to attend a workshop on Thursday, February 8, at 5:30 p.m. in 124 Sparks Building on applying for Erickson Discovery Grants and other funding opportunities to support summer research. The deadline to apply for the Discovery Grant is February 11. All junior honors students should consider applying for grants. Andrew Belser is professor of movement, voice and acting in the School of Theatre, and director of the Artand Design Research Incubator (ADRI) at Penn State. He is the producer/director of FaceAge, a multimedia installation and documentary film, exploring issues of identity, gender, sexuality, and ethnicity through the lens of aging. All are invited to stay for a reception in Mann Assembly Room immediately following the presentation. "Finding a Donor: The Social Origins of Living Donor Kidney Transplant Underutilization and Racial/Ethnic Disparities"
The Paterno Fellows Program has reserved a small block of tickets for Love in Hate Nation. You may purchase one or two tickets for only $2 each (cash only!) instead of the usual student price of $12.50. These tickets are for Penn State students only, but if you purchase two, the second person does not have to be in PFP. Tickets may be purchased while supplies last from 9:00 a.m.–4:00 p.m. in 103 Sparks Building through February 12, when unsold tickets must be returned to the Box Office. Students in LA 297 Everyday Diplomacy will be provided with one free ticket, and do not have to purchase theirs from the PFP Office. 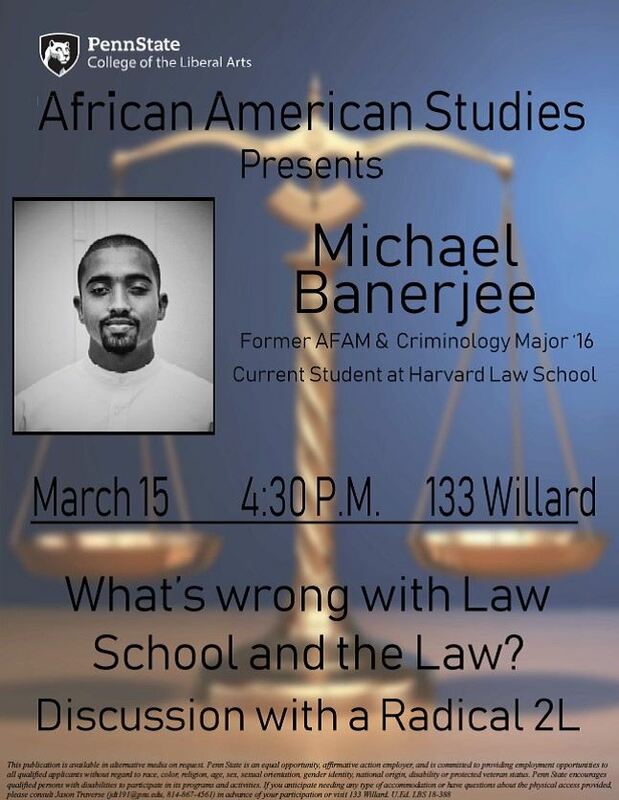 "Religion, Ethnicity, and the Politics of Identity in Southern Sudan"
"How to Reach your Own Conclusions about the Ethics of Raising Animals for Food: A Roadmap"
Meet Michael Banerjee, ’16 PF Criminology and African American Studies, now a student at Harvard Law School. "What Video Games Can Teach You about Humans"
"What is the common good, and should we always promote it?" Audience members will vote on their position by smartphone before, during, and after the discussion. "Toxic Ties: Social Networks of Cyber Agression"
"What Athletes Can Teach Us about Politics"
"Reconciling the Past: U.S. Based Truth Commissions and the Struggle for Racial Justice"
"The Ins and Outs of Writing a Thesis: What Every Student Needs to Know"
This ceremony recognizes Paterno Fellows who are graduating with honors with two or more areas of academic study, with study abroad and/or internship credentials, and with leadership or service accomplishments. We look forward to seeing all graduating Fellows and their families! The College of the Liberal Arts Commencement Ceremony is on Saturday, May 5, at 6:30 p.m. at the Bryce Jordan Center. The College of the Liberal Arts holds separate ceremonies and receptions throughout the day on Saturday for departments to celebrate their students' achievements. View the schedule for Distinguished Students, Paterno Fellows, and Department ceremonies here. Get to know PFP Director, Catherine Wanner, and meet your fellow Fellows while enjoying some refreshments! "What the Hybrid War between Russia and Ukraine Can Teach Us about Contemporary American Politics"
During this annual event, volunteers take turns reading over a 24-hour period. This year's event, First Books, focuses on author's first published books or the first book in a series by authors from all around the world. Each title will be available in English and the original language in which it was published. Check out the poster for more info. "Growing Up with Cars: Past and Present"
Panel Discussion: "Human Rights Around the Globe: Flourishing or Failing?" Join the Penn State School of International Affairs, Penn State Law, and the Rock Ethics Institute for a panel of distinguished experts on international human rights discussing the current state of human rights across the world, moderated by SIA director Scott Gartner. "Right from Wrong: Creating Robots Which Learn How to Behave"
"Muslims, Christians, and Jews in Islamic Spain"
"Beyond Penn State: Considering Graduate School and Fellowship Opportunities"
Paterno Fellows Salon is a monthly discussion group that features writers, artists, and philosophers who informally meet with students to discuss ideas. Let's challenge the way we see the world. "Fake News, Disaster Fiction, and Japanese Twitterature"
"Sport Technology: Perils and Promises"
"Expanding your Horizons: An Overview of Liberal Arts Enrichment Resources"
Public Lecture: "The Joke is Mightier than the Sword"
Bassem Youssef, dubbed the Jon Stewart of the Arab World, was the host of the popular TV show Al-Bernameg which was the first of its kind, political satire show in the Middle East. Originally a 5-minute show on YouTube, Al-Bernameg became the first online to TV conversion in the Middle East and the most watched show across the region with 30 million viewers every week. Throughout its three seasons, Al-Bernameg remained controversial through its humorous yet bold criticism of the ruling powers, which led to tens of lawsuits being filed against the show and its host. Sophia McClennen, Professor of Comparative Literature and International Affairs, will moderate the discussion with Bassem Youssef, host of the popular TV show Al-Bernameg, and Sara Taksler, a senior producer at The Daily Show with Jon Stewart. A book signing of Youssef's Revolution for Dummies and reception will follow. "(Un)natural Disaster: Vulnerability, Long-Distance Displacement, and the Extended Geography of Neighborhood Distress and Attainment after Katrina"
McGraw will also speak at 12:30 p.m. on November 14 in Foster Auditorium, Pattee Library. This event is free and open to the public; no RSVP required. Natasha Adams, Global Safety Manager, and Kate Manni, Assistant Director for Embedded Programs, University Office of Global Programs, will present an emergency preparedness workshop and answer your questions as you consider a Study Abroad or International Internship experience. Chelsea Keen, Global Experiences Coordinator with the College of the Liberal Arts Career Enrichment Network will answer your LA-specific questions. "Displacement and Disinvestment: Understanding Systemic Inequality across City and Country"
"Facing Ferguson: Ethics in the Age of #BlackLivesMatter"
"Morals or Markets? Assisted Reproductive Technologies and Politics in the U.S."